Leslie Charteris was born Leslie Charles Bowyer-Yin in Singapore on May 12th, 1907. The son of a Chinese doctor and an English woman he was determined to become a writer from a very early age. His first published work was a poem which appeared in The Straits Times when he was just nine and a half years old. Along with his mother and younger brother he moved to London in 1919 and wrote the first Saint adventure, Meet the Tiger (published in 1928), when he was just twenty years old. Leslie Charteris went on to write a further eight-nine titles featuring Simon Templar his most famous hero. Simon Templar and The Saint books and character has inspired many inspired many films, radio series, comic strips, and several television series. Collectors main emphasis are The Saint books (and until the series were re-published in 2013 most collectors had to seek earlier editions), but also TV & Film memorabilia, comic strips, magazines, die-cast cars, autographs etc. The origins of Simon Templar as The Saint can be found in the early works by Charteris, some of which predated the first Saint novel, 1928’s Meet the Tiger, or were written after it but before Charteris committed to writing a Saint series. Burl Barer reveals that an obscure early work, Daredevil, not only featured a heroic lead who shared “Saintly” traits (down to driving the same brand of automobile) but also shared his adventures with Inspector Claud Eustace Teal—a character later a regular in Saint books. Barer writes that several early Saint stories were rewritten from non-Saint stories, including the novel She Was a Lady, which appeared in magazine form featuring a different lead character. Pictured left: A first edition signed Meet the Tiger, currently up for sale at Abebooks for £30,000. Charteris utilized three formats for delivering his stories. Besides full-length novels, he wrote novellas for the most part published in magazines and later in volumes of two or three stories. He also wrote short stories featuring the character, again mostly for magazines and later compiled into omnibus editions. In later years these short stories carried a common theme, such as the women Templar meets or exotic places he visits. With the exception of Meet the Tiger, chapter titles of Templar novels usually contain a descriptive phrase describing the events of the chapter; for example, Chapter Four of Knight Templar is entitled “How Simon Templar dozed in the Green Park and discovered a new use for toothpaste”. Pictured right: A first edition of the second Saint book, Enter the Saint. This copy has a price tag of nearly £4,000 at James M Pickard Fine and Rare Books. The origins of The Saint can be found in early works by Charteris, some of which predated the first Saint novel, 1928’s Meet the Tiger, or were written after it but before Charteris committed to writing a Saint series. Burl Barer reveals that an obscure early work, Daredevil, not only featured a heroic lead who shared “Saintly” traits (down to driving the same brand of automobile) but also shared his adventures with Inspector Claud Eustace Teal—a character later a regular in Saint books. Barer writes that several early Saint stories were rewritten from non-Saint stories, including the novel She Was a Lady, which appeared in magazine form featuring a different lead character. The period of the books begins in the 1920s and moves to the 1970s as the 50 books progress (the character being seemingly ageless). In early books most activities are illegal, although directed at villains. In later books, this becomes less so. In books written during World War II, The Saint was recruited by the government to help track spies and similar undercover work. Later he became a cold warrior fighting Communism. The quality of writing also changes; early books have a freshness which becomes replaced by cynicism in later works. A few Saint stories crossed into science fiction and fantasy, “The Man Who Liked Ants” and the early novel The Last Hero being examples. When early Saint books were republished in the 1960s to the 1980s, it was not uncommon to see freshly written introductions by Charteris apologizing for the out-of-date tone; according to a Charteris “apology” in a 1969 paperback of Featuring the Saint, he attempted to update some earlier stories when they were reprinted but gave up and let them sit as period pieces. The 1963 edition of the short story collection The Happy Highwayman contains examples of abandoned revisions; in one story published in the 1930s (“The Star Producers”), references to actors of the 1930s were replaced for 1963 with names of current movie stars; another 1930s-era story, “The Man Who Was Lucky”, added references to atomic power. 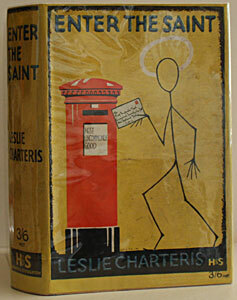 Charteris started retiring from writing books following 1963’s The Saint in the Sun. The next book to carry Charteris’s name, 1964’s Vendetta for the Saint, was written by science fiction author Harry Harrison, who had worked on the Saint comic strip, after which Charteris edited and revised the manuscript. Between 1964 and 1983, another 14 Saint books would be published, credited to Charteris but written by others. In his introduction to the first, The Saint on TV, Charteris called these volumes a team effort in which he oversaw selection of stories, initially adaptations of scripts written the 1962–69 TV series The Saint, and with Fleming Lee writing the adaptations (other authors took over from Lee). Charteris and Lee collaborated on two Saint novels in the 1970s, The Saint in Pursuit (based on a story by Charteris for the Saint comic strip) and The Saint and the People Importers. The “team” writers were usually credited on the title page, if not the cover. One later volume, Catch the Saint, was an experiment in returning The Saint to his period, prior to the Second World War (as opposed to recent Saint books set in the present day). 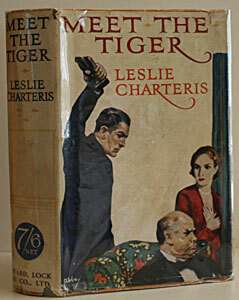 The last Saint volume in the line of books starting with Meet the Tiger in 1928 was Salvage for the Saint, published in 1983. According to the Saintly Bible website, every Saint book published between 1928 and 1983 saw the first edition issued by Hodder and Stoughton in the UK (a company that originally published only religious books) and The Crime Club (an imprint of Doubleday that specialized in mystery and detective fiction) in the United States. For the first 20 years, the books were first published in Britain, with the U.S. edition following up to a year later. By the late 1940s to early 1950s, this situation had been reversed. In one case—The Saint to the Rescue—a British edition did not appear until nearly two years after the American one. AbeBooks.co.uk – find Leslie Charteris and more than 110 million out-of-print books worldwide. The Saint drove a number of cars in the books, the two most well know and the most produced as die-cast models are the Volvo P1800 and the Jaguar XJS. According the the Saint.org, these cars were also driven by The Saint: a silver blue BMW R100RS Motorcycle also used in The Return of the Saint with Ian Ogilvy, a black Lamborghini Countach that Andrew Clarke drove in The Saint in Manhattan, a dark blue Jensen Interceptor used in The Saint with Simon Dutton, and the mythical Hirondel that The Saint drove in many of the books. 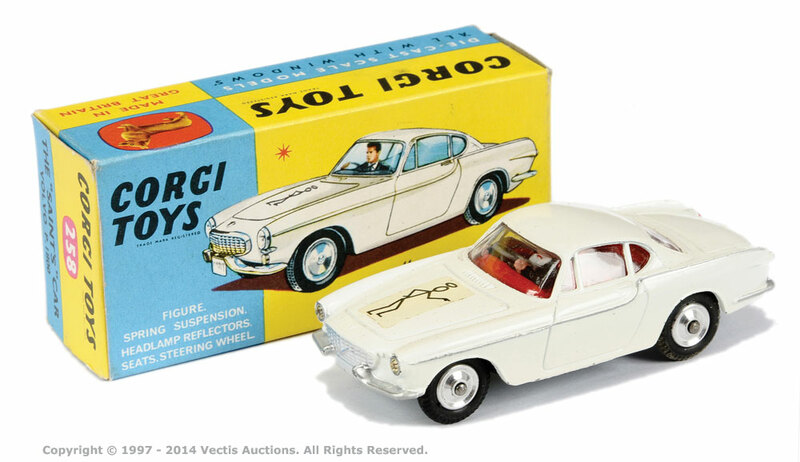 Corgi have produced a number of models over the years, the most famous being the Corgi No.258 “The Saint” Volvo P1800. As with many collectibles, condition is paramount. A perfect model in a mint original box could fetch £150-£200 against a lesser model without a box which may only cost £20. 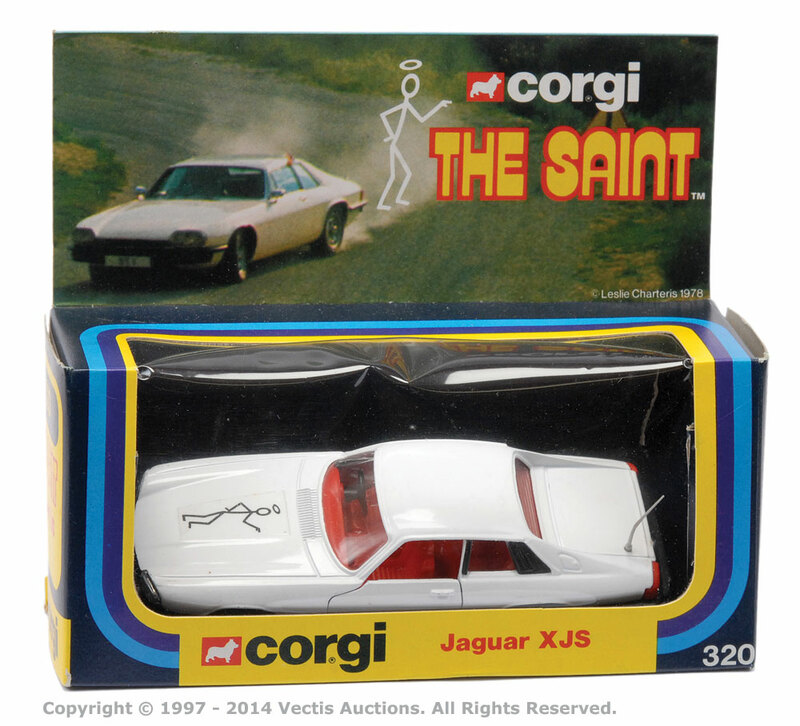 Corgi No.320 “The Saint” Jaguar XJS – white, red interior, dish wheels – Mint in a Near Mint striped window box. Sold for £25 at Vectis Autions April 2014. Corgi No.258 “The Saint” Volvo P1800 – off white body, red interior with figure driver, spun hubs. Sold for £120 at Vectis Auctions February 2014.